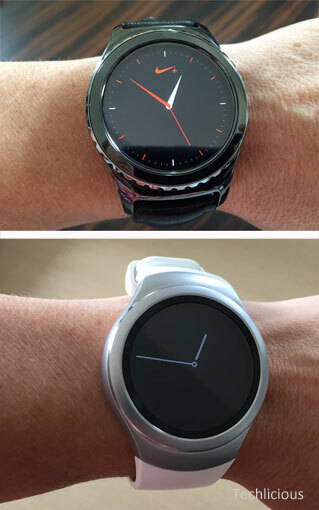 (top) and the Gear S2 (bottom). For the last three months, my wrist has been adorned by an Apple Watch. After 30-plus years of not wearing a watch, my wrist already feels naked without my smartwatch and, despite my initial misgivings, it enhances my daily activities. Samsung says a lot more people will feel as I do about wearing a smartwatch, anticipating 100 million smartwatches sold by 2020. And of course, Samsung hopes a large chunk of those will be Samsungs. Here in Berlin yesterday, Andrea Smith and I got a 45 minute hands-on with Samsung’s two new Gear S2 smartwatches before they were officially unveiled during IFA , the S2 and the S2 Classic. I was hard pressed to distinguish between the S2 and my Apple Watch, other than their obvious physical differences. But three seemingly minor quirks annoyed me during our short time with the Gear S2. For the Gear S2, Samsung has designed a big round Charlie Brown watch face. The 1.2-inch screen offers less viewable real estate than the larger Apple Watch due to its circular shape. The screen's spherical nature altered text display, rendering it unnaturally short at top and bottom and wide in the middle. It's sort of like dealing with a round business card amidst a handful of normal rectangular ones. The S2 Classic comes with a traditional and quite comfy leather belt buckle band. The bezel is ridged, lending it a more executive, "Mad Men" aesthetic. The Classic's body looks metallic, but I couldn't tell what it was made from, and Samsung wasn't telling. By comparison, the standard Gear S2's ceramic bezel is largely smooth and minimalistic. Its rubberized plastic band resembles the Apple Watch Sport band, also made from an unnamed synthetic materials — probably polystyrene like the Apple Watch band. 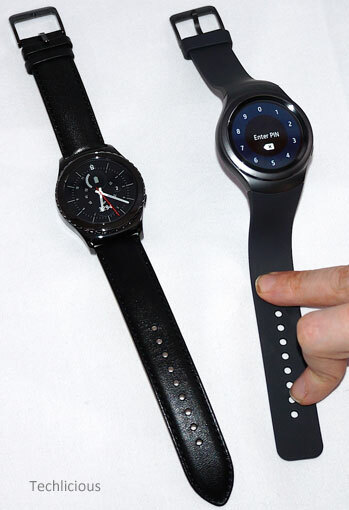 Both Gear S2 models come in one size with two bands, one larger than the other. The smaller band is designed with a steeper angle off the face to compensate for smaller wrists. The bands are easily swappable, and Samsung and presumably third-party accessory makers will supply fashionable alternatives. It looks like there'll be nine band choices at launch. Both S2s can connect with any Android phone via Bluetooth 4.0 or higher running Android 4.4 or later (most Android phones made within the last 12 to 18 months) and containing at least 1.5GB of RAM and a complete suite of Google phone and messaging APIs. Neither model will work if the phone maker has futzed with the OS. Right now, the Gear S2 offers more customizable watch faces than the Apple Watch, 29 to Apple’s 11; this will change when Apple releases Apple Watch OS2, due any time. Both watch makers offer a similar range of options to customize colors, functions and status icons. While the app icons of Apple and Samsung smartwatches show a striking similarity, Samsung's health apps offer fun animations like a blipping heart monitor. The Gear S2 senses when you're exercising and automatically opens its fitness tracking app. Hopefully it won't pop up when you're simply sprinting for a train or after your wayward toddler. The standard S2 doesn't sit flat on its back — see the picture of a compatriot holding it down to get a side-by-side photo — and it might not even sit up on the proprietary magnetic charger. I didn't see a charger on display. The Gear’s inability to lie flat may be a bigger problem with the smaller band, which hangs off the S2 at a steeper angle. The Classic has its own functional disadvantage: It connects only via Bluetooth, while the standard S2 includes a 3G connection for independent email, texting, music streaming and presumably actual phone calls, without needing a connected Bluetooth-connected phone. At the moment, AT&T, T-Mobile, U.S. Cellular and Verizon are all due to carry the S2. The Classic also lacks a microphone for use with S Voice functions such as dictation. In other words, the Classic looks executive and premium, but it’s actually the entry-level model based on its functions. The Gear S2's round face allowed Samsung to equip the watch with a spinnable bezel that lets you easily cycle through functions like weather, music play, activity tracking, calendar and so on. The bezel on both versions spins with little resistance. As a result, it might easily spin off the clock space with only a minor provocation, such reaching into your pocket or bag. You also can swipe across the Gear S2 to cycle through function options. While the S2 wakes like the Apple Watch when it senses checking-the-time wrist movement, it does not wake-to-touch like the Apple Watch does. If for some reason the S2 doesn't wake when you want it, such as going to sleep even when you are holding it up, you have to twist your wrist again or hit one of the two side buttons (Home/Apps, Back) to wake it. Both S2 models are equipped with NFC and Samsung Pay, which work with magnetic card readers, unlike Apple Pay. To use Samsung Pay, you'll need one of the five Samsung Pay-compatible Samsung phones: the S6, the S6 Edge, the S6 Edge Plus, the S6 Active or the Galaxy Note 5. 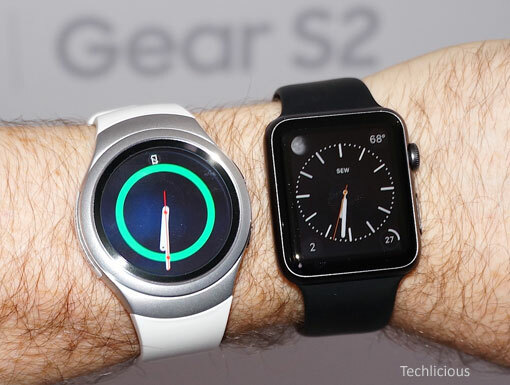 Samsung says the Gear S2 will run two to three days on a single charge. If that’s true, the S2 will serve slightly longer than the Apple Watch, which you can stretch to run for maybe two days. The Gear S2 is also a bit more weather-resistant than the Apple Watch, which is merely splash-resistant. The IP68-rated S2 can stand up to 30 minutes in 1.5 meters (around 4.5 feet) of water, which means it can survive one of the most common portable mishaps: accidental toilet drops. All in all, the Gear S2 seems to be a highly functional smartwatch with several advantages and disadvantages when compared to the Apple Watch. Your decision will be based in what OS universe you live. A final determination for anyone without a strong OS preference will only be possible once we know the Gear S2's pricing — always the great decider — and after some operational comparisons. Watch this space.